Dude I am going to say this looks more like some sort of deficiency/toxicity more than anything else. Your temps in my view are fine and well within the temps I have grown regularly without problems. Some days here it's so humid the tent walls are wet. I rarely have issues once I get the fans all working. PH will normally drift as the plants use nutrients and produce exudate from the roots etc but it's not normally an issue unless it sits outside 5.8- 6.2 for too long. Some additives will buffer better than others, so PH will remain more stable.Some additives I have tried I have abandoned because they cause the PH to fluctuate too much to be able to keep it stable. If this happens then the plant will stress and likely develop deficiencies, which may cause you to over correct and cause nutrient toxicity. Is your PH pen accurate? Have you tested it against a buffer solution you are certain of? What I do when I am stumped like this is to revert to a standard time reliable 1.94 grams of MaxiBloom per litre of water, set the PH to 5.8 and give it a few days. Not fancy, but it works. I have never had a serious nutrient deficiency with this dose and know a good number of people who use this ration right the way through. If it's in veg I will use this mix at half strength via foliar feeding, while just giving the roots straight water with a PH of 5.8. In a few days you will normally be able to tell if it's a nutrient issue as you will get noticeable green tip growth. 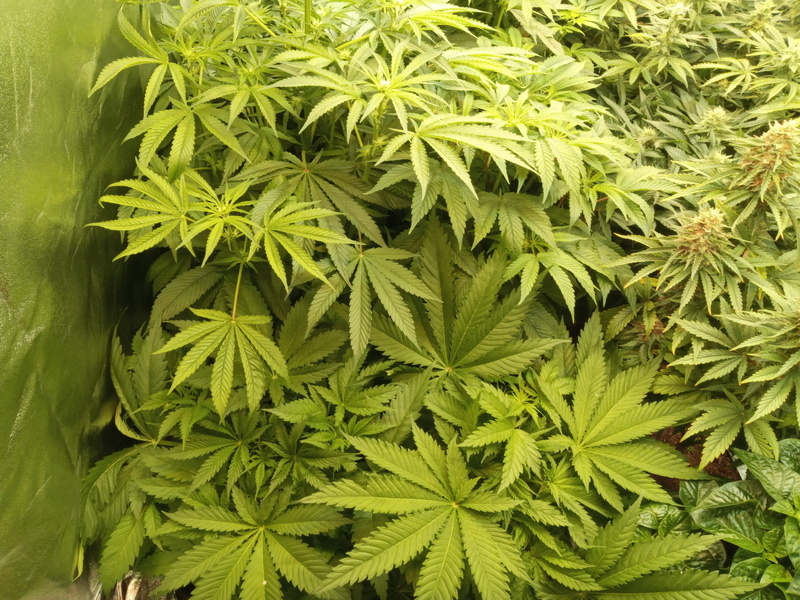 Also keep in mind that deficiency/toxicity does not all effect the leaf the same way, as in some deficiencies will damage the leaves and correcting it won't fix those leaves already damaged. It's not until the new leaves come through that you can tell. 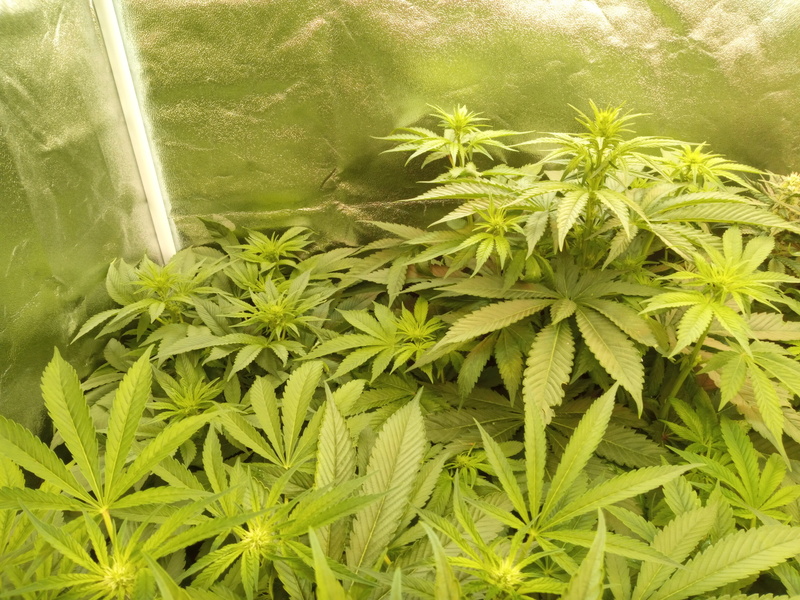 Some deficiencies like Nitrogen for example WILL result in the leaves looking better almost immediately, in this case because higher levels of nitrogen allows for higher rates of synthesis of chlorophyll so the leaves become greener and look healthier etc. Over correction is the obvious risk with this situation. Every ww I've grown has had a deficiency during veg. It disappears a week or two into flower. It doesnt bother them at all. Mine did indeed sit outside of 6.2, more like 6.4 if I was around to put it back in check. I just calibrated my PH pen and it was out by .1, so i initially started with 5.9. I just bought some more 4.0 and 7.0 solution and i'll be checking every 2 weeks. Additives, great advice! I've just mixed 3 buckets of solution and letting them sit for awhile to see if any difference in the amount the PH raises. So ill check up on it after 12hrs and 24hrs. I'm going to be more diligent with my growing and actually write it down, cause who knows in my old age I may be making another stupid mistake which I'm sure it is. Heck..just that PH pen being out of wack is a stike against me lol. Maybe I did over feed it also..
Maybe cut the calmag and try some Epsom salt. I'll cut out the calmag, as did enough reading in the past 5hrs with people saying its not needed for their latest formula, and forgot to add those damn epsom salts which you told me last time. Yeah so too long at 6.4 is potentially likely to start to cause some lockout issues, so it could be that you are seeing, and the thing is that different strains will react differently to PH. Some seem to be able to grow in just about anything, while some are all soft and sensitive, some freak out if overfed, some just hoover it up. I reckon it's good to get a few grows sorted as a baseline with a real simple nutrient mix such as a simple one powder nutrient all the way from start to finish. Again I have no experience with the nutrients you are using so I really don't know what is in them but it is not uncommon for some nutrient recommendations to be significantly stronger that they need to be. So, I've seen issues this with Canna nutes in coco, as well as a few others where some plants were just more or less poisoned by overfeeding at the manufactures recommended rate of application. also when you start to be putting in all these additives without really knowing what they will do and what the plant really needs then it's real easy to lose control of the situation and be seesawing between underfed and overfed as you try to stabilise it. Are you flushing it through with PH'd water on a regular basis to wash out the salts? Too much salt in the coco will really screw with the plant. All sorts of weird stuff happens that is hard to pin down. To me it seems your temps and humidity should be fine, I think you can count that out. Seriously where I live, it's nearly always hotter than you describe, even in the depths of winter, I get the occasional bud rot if I'm slack but that is about it. I have not been flushing, seems to be the norm with using autopots, BUT moving forward I will. When I took the pot off the system there was clearly some salt build up. I've been using dripclean which helps but clearly not enough. Also just checked some of the nutrients I mixed and all of them are 5.45ph, Not even using ph up or down..so I've scrubbed down my res and pushed some hot water through the tubes to clean them out. The res was filthy, so much sediment in it, so moving forward no more topping off. Dump, clean and refresh! I'm sure I'll still get a nice harvest from her. I think more than my first one, which is still curing. Hey @cdnBuddy, it sounds like you've been chasing pH for quite a while. I read through a lot of your thread and didn't see you mention what your water situation is. Is it well water or city/municipal water? What's the starting pH (out of the tap)? When I was successfully growing in soil, I had city water. I assumed it was pH neutral and had calcium and magnesium in it. I also assume it had chlorine in it, so before I used it, I would let it sit out for days before using it, allowing the chlorine to evaporate. I literally never measured the pH of my water and never had issues with my soil grows. Then I moved to a home with well water and everything changed. In my new location, my well water was pristine. I sent it out for testing and the PPM came back at ZERO! Unfortunately, it was not potable due to the extremely low pH (like, 4.8 or 4.9!!). I had no idea how bad this was going to be for my soil grows, but it was horrible. Even though my water tested as pure, the testing did not pick up the copper that was being leached from my water lines. 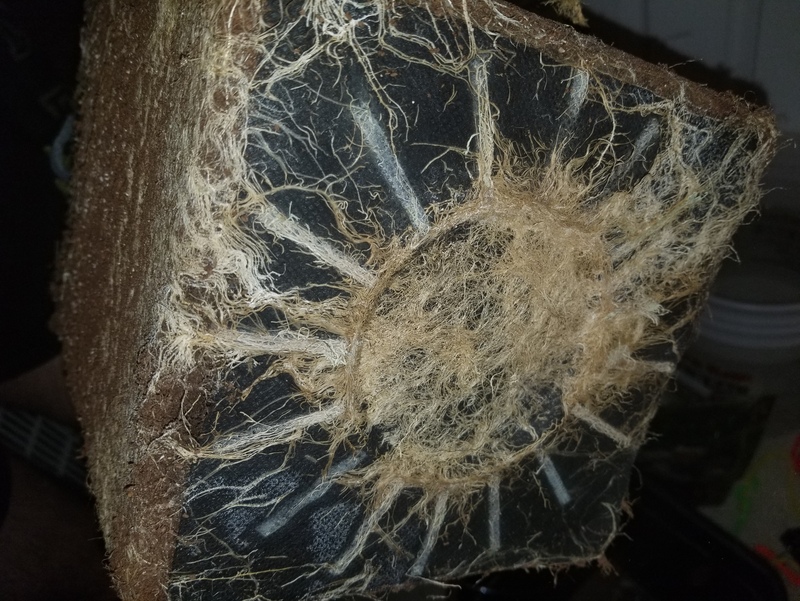 Copper kills roots and it builds up in soil, so the soil becomes a toxic, untenable medium for growing anything in a container. I installed a whole-house chemical injection system, which injects a potash solution into my water as it was going into the pressure tank. This helped get my water to a potable level and stopped the leaching from the copper pipes, but ultimately, I learned that my soil method would not work with my water. I chased pH and new methods for more than a year, eventually going with a hydroponic setup and installing a reverse osmosis system for my water. My R/O water was still very acidic (low pH), but it was also pure and without any copper. I continued to chase pH and it continued to be elusive, but my grows were getting better, so I stuck with my hydro setup and tried a variety of nutes. I ultimately tried "House and Garden" nutes and loved them. Then I tried House and Garden nutes without doing anything about my pH - and BINGO! I literally stopped caring about my pH or PPM. I just stuck with their feeding schedule, added some cal/mag to the water, and flushed with only water for the last week or 2 of each grow. Perhaps I would have the same consistent results with another brand of nutes, but once I corrected my water issues, then hit the jackpot with House and Garden, I stopped looking. My point is more that the water might be your issue. You need to understand what you're starting with and get that dialed in before you chase your tail and hope to catch it. So after cleaning my reservoir I noticed that the nutrients just make some god awful sediment which I'm assuming is causing my PH to drift like crazy..stupid me didn't think to check the EC of my res before dumping because I have just been topping up. I wonder if that crept up also..maybe the water evaporating. I hope my chasing days are over if I wash out my res once a week. I did start with remo nutrients but I would be spending a fortune on nutrients a year, and I switched to Megacrop once it was available in Canada. I was following someone on AFN and he was using this combo, and also didnt clean res. What works for him, clearly doesnt for me! Honestly I have yet to find a journal with someone using Megacrop that isn't blown away by the results. Also hard to find someone that has any issues with it, unless it's an error on their end. What I should have been doing was keep notes of my res, checking it daily just to see what's going on. My routine was been wake up, PH down and before bed do the same. I'm starting to do this today (should have done it 3months ago), and if after a week of monitoring it hopefully the next plant doesn't have this issue. Just doesn't make sense that throughout veg/mid flower it's great then all goes to hell. So if all goes well at the 24hr mark and PH goes to 5.5 that would be amazing. A .05 increase in 24hrs compared to .4 jump in 24hrs. If that happens I'll be in the same boat as you! You're one hell of a trooper to stick with PH swings for a year! Those looks great! Another week or 2 they will try to bust out the tent. Overall i'm not worried about my current plant, as she's in way better shape then the last one, so i'm getting better! Once I adjust my PH as you suggested my next plant hopefully looks as good as these ones! Along with me cleaning my res, and calibrating my ph pen. People stress a little much about ph. I know it's important but if you can keep it within the 5.4 - 6.2 range your plants will be fine. I used to chase every single change that looked like an issue and I finally said f*ck it and just let them do their thing. I've never looked back since and they basically grow themselves. Only worry I've got it the tent is slightly over crowded as I had plans to put some outdoors but the weather changed and it snowed so I crammed them into the flower tent and figured I'd deal with it as problems arise. So in my setup, I was doing ebb and flow, pushing about 30 gallons from the main reservoir into (16) 3 gallon buckets through the controller res via 1/2 inch tubing. I might have cleaned each res a couple times during each grow cycle, but I cleaned the tubing only once per grow cycle. The tubing almost always had some nasty buildup, but I would use a high-velocity hose to shoot a bottle scrubber through each line and they were like new every time. In other words, cleaning the res is important, but cleaning the water lines (and all the connectors) is imperative. Regarding sediment, that's one of the things I loved about the House and Garden line. There was never any sediment hiding anywhere - as long as you mixed the shooting powder in thoroughly when adding it towards the end of 12/12. Oh, and sticking with the pH swings for so long would have been insane if I didn't keep trying new things, but I must admit - I don't miss it! 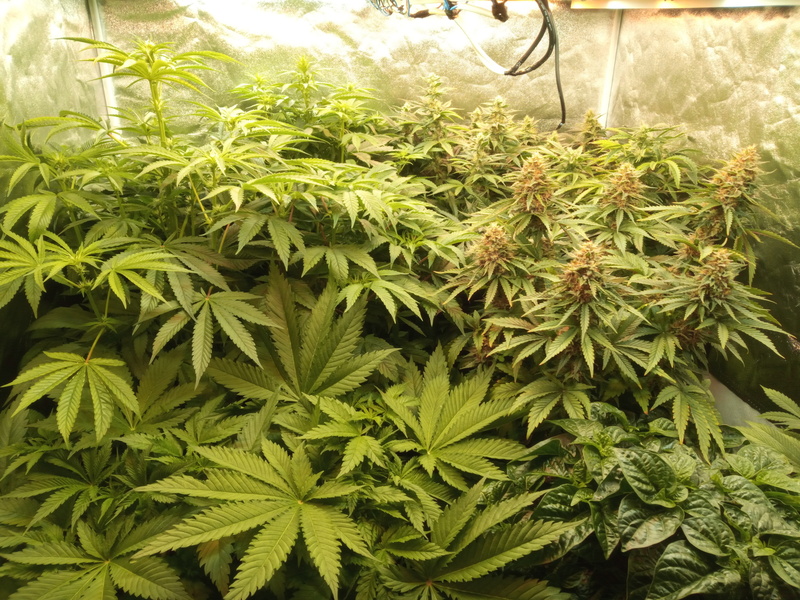 Have you tried a grow with your current nutes and system without adjusting your pH? I haven't but its now been 21hrs since Ive mixed up my batch and it's been sitting in the res and it's sitting at 5.45. Looks perfect to me! The lines I'm ordering a set just so I can switch them up, and clean the old ones. It's been 3months and no blockage issues but don't want to risk pushing them any further. I think she is solved...but i'll give it a week just to make sure. Ph sitting at 5.45 after 21hrs after scrubbing down my res. Mind you that's with no pump in the res to stir it, I know that will make the PH climb, but ill deal with that next. Maybe put it on a timer to stir once in awhile. Edit - I've just checked my rez ph and it's at 6.1 so it's within the range I suggest. Thanks for the tip! I'm going to turn on my pump now and see how much she raises in 24hrs. Till then I can feed by hand. 24hrs later with the reservoir pump running straight my pH climbed to 5.95. So moving forward i'll be sure to clean out my reservoir weekly just to keep it clean. Hoping this is the bane of all my problems, I also moved my big gal out to the side just to give her a rest and will be hooking her back up to the res. tomorrow after work. Plopped a new seed also, as my plant in flowering is about 2 weeks away from being done. I'll be using some 4" peat moss pots suggested by @Esrgood4u, and this time going to throw a bit of perlite in the mix. 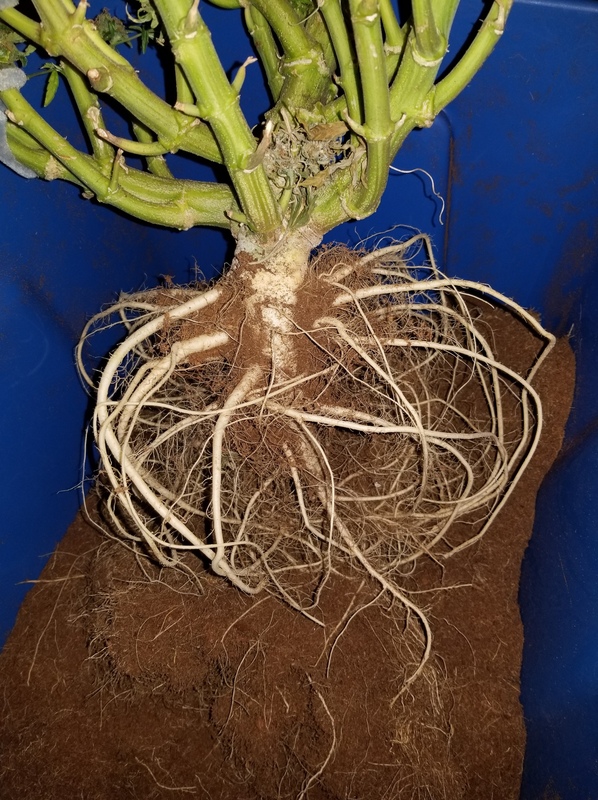 Also thought it was time to remove the stump from my first plant. The autodome was incase with roots. 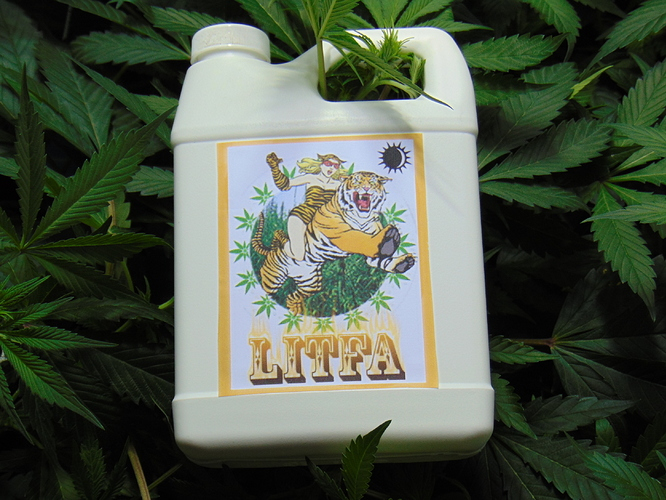 Never underestimate LITFA. A critical element in every successful grow. Jah!